The genus Agathis (Araucariaceae) includes about 13 species of tropical to warm temperate trees found from Malesia, through Australia to New Zealand. Kauri (Agathis australis) is a dominant tree in lowland forests of northern New Zealand (Steward and Beveridge 2010). Giant individual trees can reach over 4.5 m in trunk diameter and exceed 1,000 years in age, and are cultural icons (Beever et al., 2009). In 1972 a Phytophthora was associated with dead and dying trees in a kauri forest stand on Great Barrier Island, an island off the northern New Zealand coast (Gadgil, 1974). Symptoms included yellowing of foliage, canopy thinning and occasional tree death. The causative organism was identified as P. heveae by J. Stamps of the Commonwealth Mycological Institute (Gadgil, 1974). In 2006, Phytophthora ‘taxon Agathis’ was reported from kauri in a forest west of Auckland on regenerating and mature trees (Beever et al., 2009). The original identification of the causative organism as P. heveae was questioned, as the ITS–sequence of the isolate obtained from the Great Barrier Island and those from the mainland since 2006 was identical to P. castaneae. 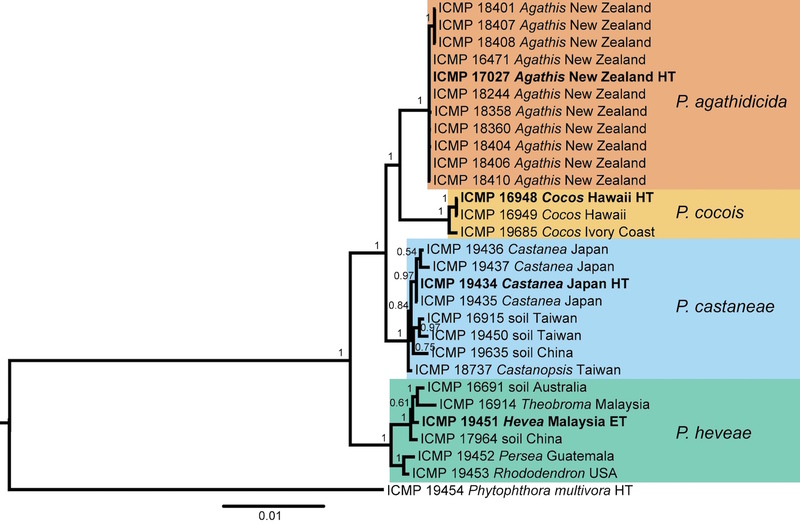 This raised the possibility that the kauri Phytophthora was a new species within Clade 5 of the genus (Blair et al. 2008). The ‘Kauri killing’ Phytophthora organism has been now formally described as Phytophthora agathidicida B.S. Weir, Beever, Pennycook & Bellgard (Weir et al., 2015), distinct from P. castaneae and other species of Phytophthora. Top: globose to ovoid-ellipsoid, papillate sporangium. Bottom: differentiation of the cytoplasm within papillate sporangia into zoospores, stained with acid fuchsin. 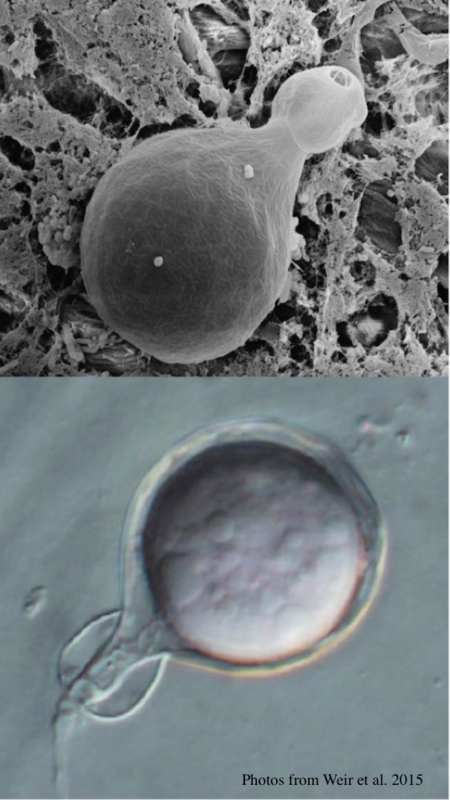 Differential oogonium ornamentation, together with the size of the oospore, was first recognised to be a diagnostic characteristic by Beever et al. (2009) in their study of representative isolates of the members of Clade 5. The mean oospore widths for P. cocois and P. heveae were not significantly different from each other nor from the Clade 5 mean, but oospore width of P. agathidicida is significantly larger than all other species and P. castaneae is significantly smaller than all other species (Weir et al., 2015). Oogonium wall ornamentation of P. agathidicida is mildly stipulate. 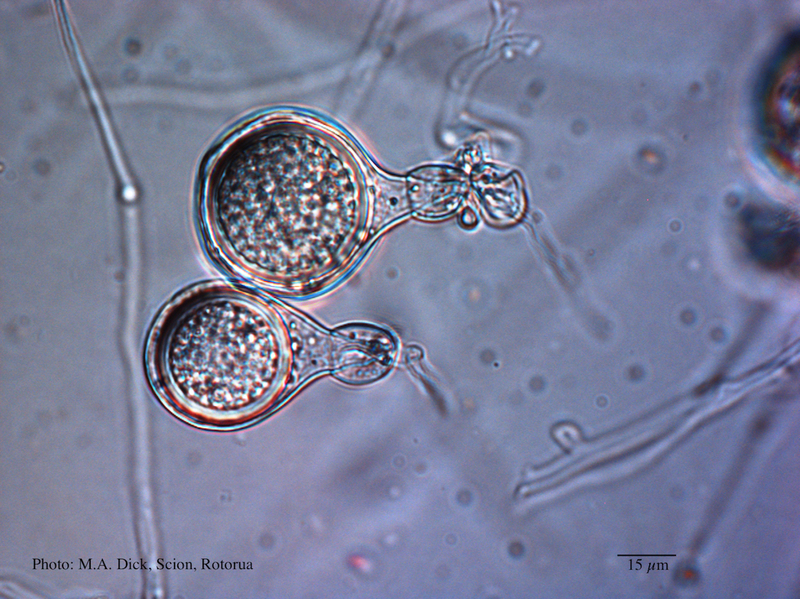 Oospores nearly fill the oogonia with a mean width of 27.7 µm, and ranging between 19.8 –35 µm. Antheridia are amphigynous, globose; some have knots at the base. P. agathidicida is homothallic. Sporangia are globose to ovoid-ellipsoid, papillate, borne terminally from long, thin, branched sporangiophores and could be formed via internal proliferation. Sporangia are non-caducous (although some isolates have a somewhat defined septum near the base of the sporangium). 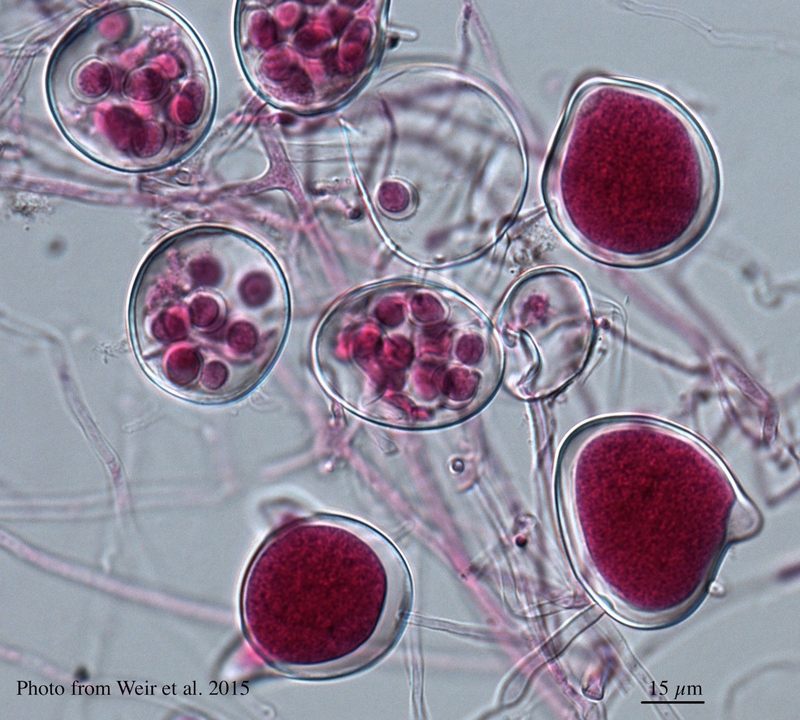 Sporangia have a mean width of 28.4 µm, ranging between12.4–50 µm, and a mean length of 39.6 µm, ranging between 14.9–75 µm. DNA sequences of eight genes (i.e. RPL10, COX1, ENL, HSP90, ITS, ND1, TIGA, and YPT1) were obtained from 29 isolates recovered from throughout the range of kauri, and concatenated to form a supermatrix alignment of 7527 bp. A Bayesian inference phylogenetic analysis of this dataset is presented. This tree is annotated with the species boundaries of the taxa that we accept; ex-type isolates are highlighted in bold and ex-holotype (HT) or ex-epitype (ET) status is indicated. We identified and described two new species in Clade 5: P. agathidicida associated with a root and collar rot of kauri, and P. cocois associated with a pod rod of coconut. Our proximal hypothesis, based upon the evidence we have to-date, remains that P. agathidicida is an exotic incursion to New Zealand. The “founder effect” observed in the P. agathidicida-branch of the phylogenetic tree of Clade 5 can be interpreted as a loss of genetic variation that occurred when the “new” population was established in New Zealand by a very small number of individuals from a larger population, from a still unknown origin. However, speculation remains around whether P. agathidicida is an introduced organism, however the Ministry of Primary Industries declared it an unwanted organism in 2009, and so biosecurity controls are in place for the communication and propagation of this pathogen. Bayesian inference phylogenetic tree of 28 isolates in the Phytophthora Clade 5 group. The scale bar indicates the number of expected changes per site (Weir et al., 2015). 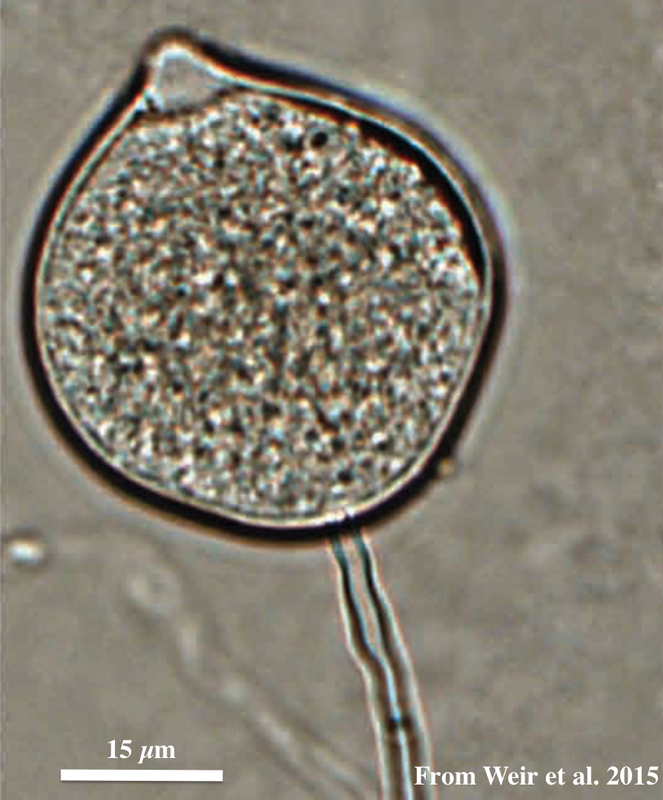 Vegetative hyphae are simple, with slight swellings, and lacking chlamydospores in culture. 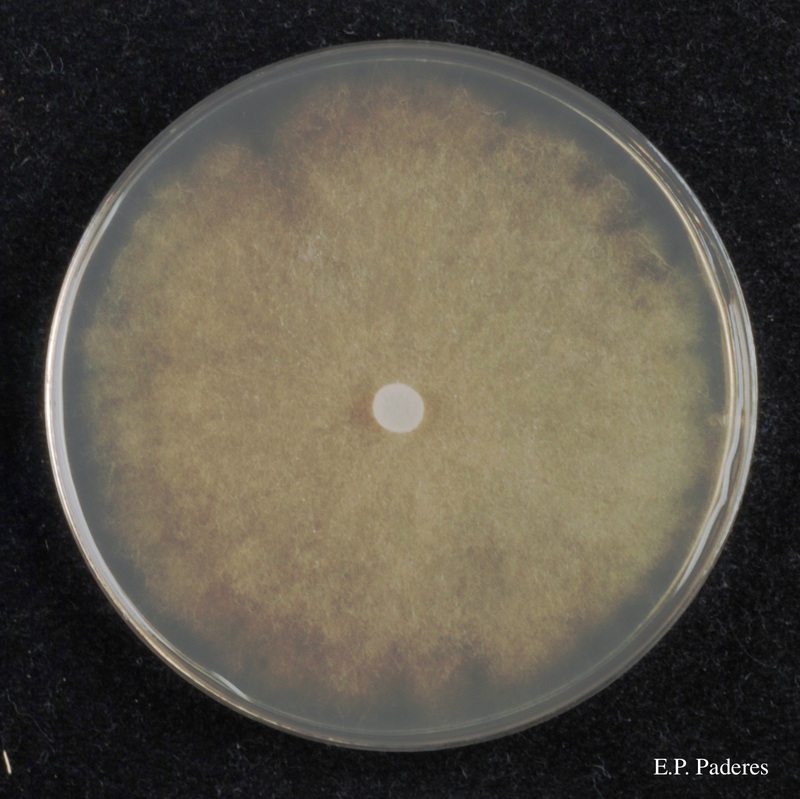 Colony morphology after 7 days was very uniform across the isolates tested on most of the media examined. Colonies are loosely aerial. On 5% clarified V8-juice agar, there is a weakly stellate radial pattern. Minimum growth temperature is 6°C; maximum 25°C; optimum 21.5°C. 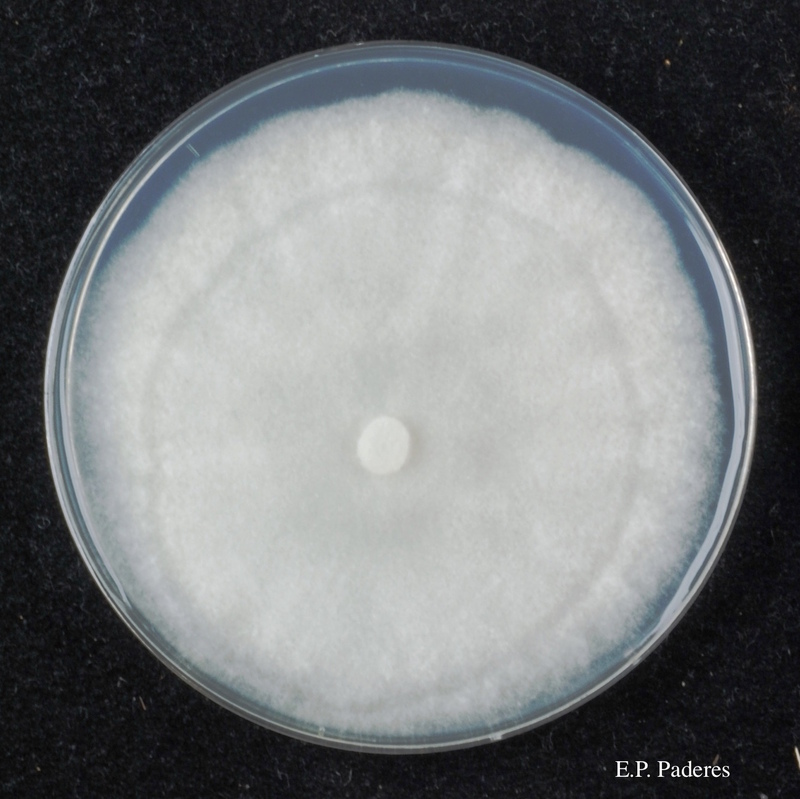 P. agathidicida also has a relatively faster growth rate than other members of Clade 5, especially at temperatures ranging from 10-20°C (Weir et al., 2015). The most reliable morphological character to differentiate P. agathidicida from the other members of Clade 5 is gametangial morphology, in particular the degree of oogonium wall ornamentation, which ranges from completely smooth in P. heveae, to coarsely bullate in P. castaneae. Oospore width, together with surface morphology (i.e. degree of wall ornamentation), have been used historically in synoptic and dichotomous keys of Phytophthora, to separate these species (e.g. Ho 1981; Stamps et al. 1990). Antheridial morphology is also important, particularly with the often reflexed antheridia of P. cocois being a unique characteristic of the “coconut” Phytophthora. For more information about Phytophthora agathidicida, visit our Disease, Education and Management materials, and Reference sections.